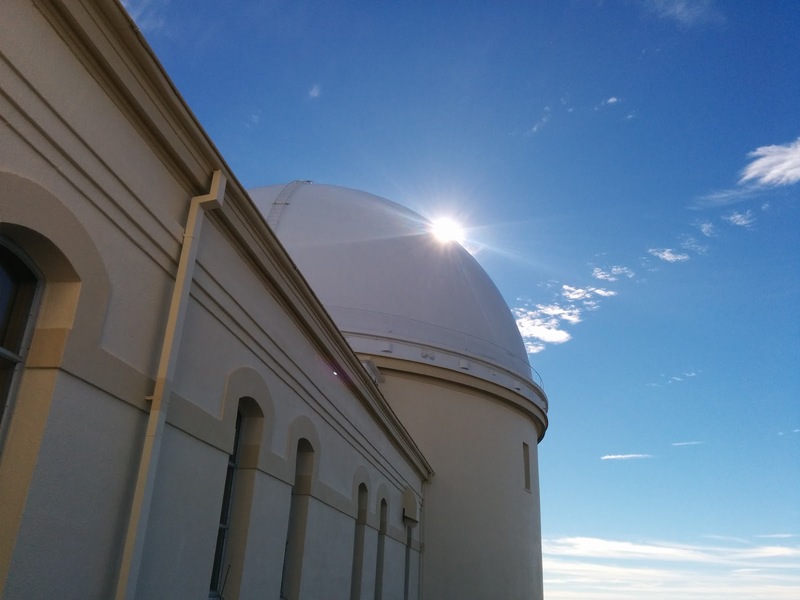 Today I took advantage of a cold, clear day to visit Mount Hamilton. Since the recent string of rainstorms we've been treated to views of green hills, which normally appear briefly in the spring but have been unfamiliar otherwise. I decided to enjoy those views by heading up to Mount Hamilton. And since I'd be setting out from home, I took the "short cut" up Quimby Road. This is a trip I've done a few times before, but not recently. In this case it would be a straight out-and-back trip, heading up Blossom Hill until it morphs into Silver Creek Valley Road, then over to the base of Quimby. That road is as steep as ever, but the cool air made it bearable. There weren't many riders on the road today. This ride was notable because, for the first time, I think I passed more riders than passed me. There were basically two groups, one slightly slower than me and the other much faster, but the faster group was slightly smaller. On the last climb I pulled off my jacket so I'd have something more-or-less dry to put on for the descent. Once at the top I dawdled for long enough to dry a little, then put on my jacket and headed down. By the bottom I was shivering; I have no idea why I didn't take extra clothes. On the way back I stopped at the little square on Ruby Avenue for a tasty and welcome latte. On Silver Creek Valley Road I made good use of the smooth pavement and steep grade to get some pretty considerable speed, for me, then continued reversing my course toward home. Today's ride was a little over 60 miles, with nearly 6700 feet of climbing. The most difficult kilometer was near the top of Quimby, which came in at 13.6%. 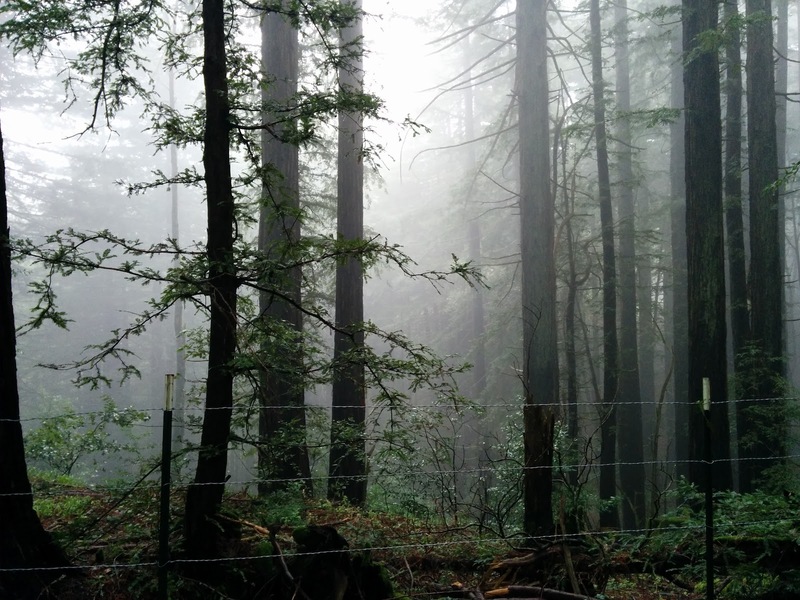 Yesterday I enjoyed a rainy holiday ride to La Honda. December 23rd was sunny and actually quite warm, and this morning there isn't a cloud in the sky. But yesterday was overcast, foggy and drizzly all day. So you can guess which day I picked for a long ride. The target was actually San Gregorio, which I thought might just be within my range. To get there and back in the daylight I'd need to get an early start. I almost did; I rolled away from the house shortly after 8. 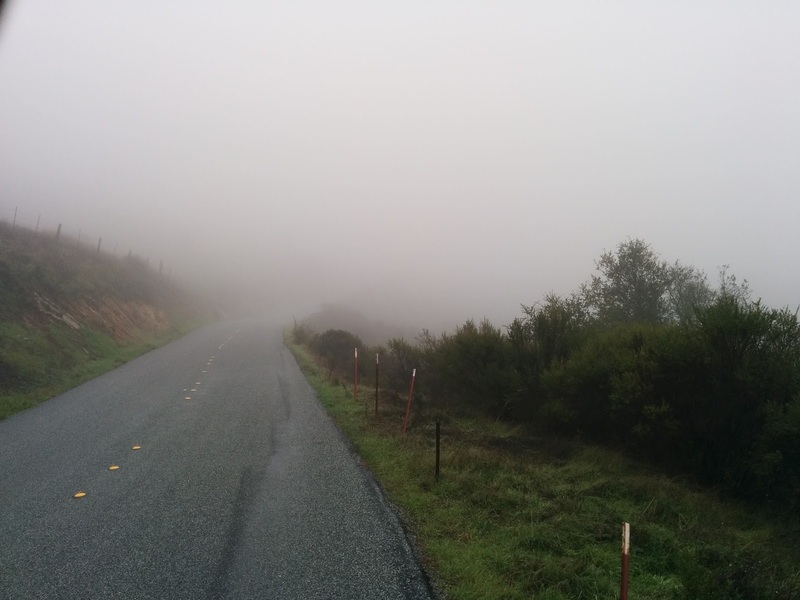 The roads were wet and largely deserted as I crossed into Los Gatos and then into Saratoga. For the first time in a long time I climbed Route 9. My memory of that climb had apparently softened; it was longer and (in parts) steeper than I expected. Near the top the wind picked up and the ever-present mist briefly turned to rain. From that perspective it seemed like I might be riding in the rain longer than my clothes and innate heat generation could bear, so thoughts of alternative routes danced in my head. Nonetheless I continued up Summit Road in the rain. The plan was to head down Alpine to La Honda, then 84 to San Gregorio, then Stage Road to Pescadero and back in some indeterminate way. At Alpine I was wet but still warm, so I thought I could at least see what the weather was like on the Santa Cruz side of the mountains. Alpine Road was so foggy that I was worried about overcooking corners that I couldn't see coming. Near the bottom the road is absolutely gorgeous, winding through thick woods. At this point it was no longer foggy but quite wet. I felt like I was going to consume my brake pads before I got to the bottom. At the junction with Highway 84, I cut the ride short by heading right toward La Honda instead of left toward San Gregorio. 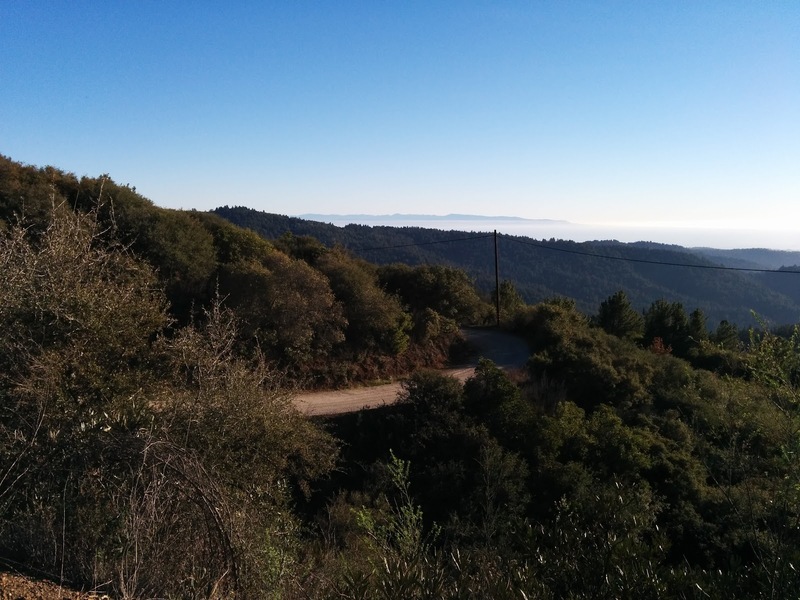 There's not much to like about climbing Highway 84, but I wanted to get to the west side of Old La Honda Road. That's a very pretty, very isolated climb. On Highway 84, even on Christmas Eve, you're constantly being passed by cars and big trucks. On Old La Honda I didn't see any cars at all, despite stopping and eating lunch. While I was eating a large group of cyclists passed by; otherwise I saw no one. I don't get up this way very much, so I decided to descend Highway 84 to Portola Valley Road, after which I headed to Alpine and Arastradero. I took Arastradero because I was unfamiliar with it, and it rewarded that curiosity by winding through a lovely open space. 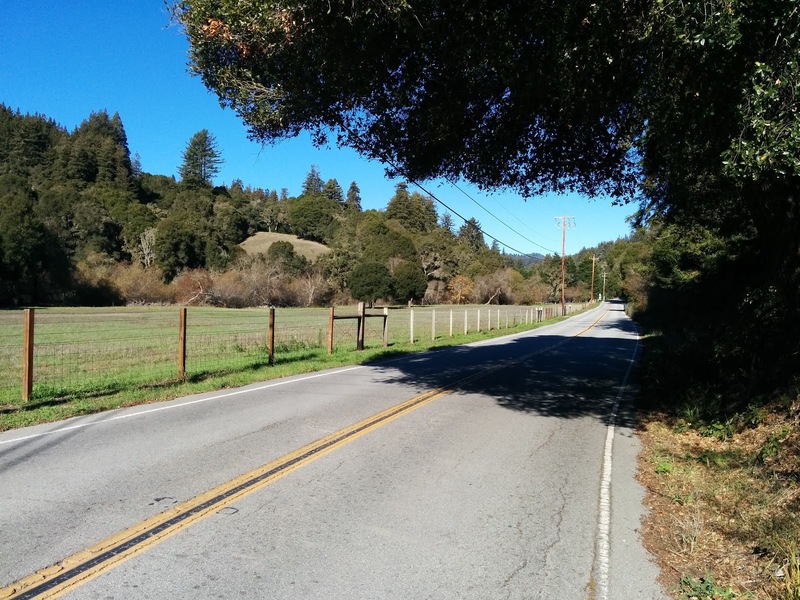 After a quick jog on Page Mill, a separate Arastradero Road crossed over 280. 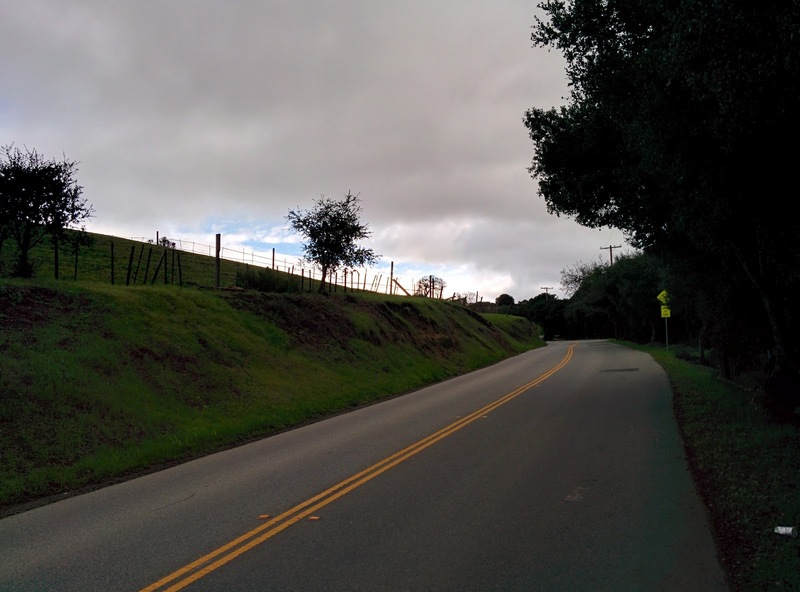 As I was looking at a map the group of riders I had seen on Old La Honda Road passed by and turned on Purissima Road. I figured they must know where they were going, so I followed. That was a good decision, because after a bewildering set of turns on nondescript roads, we ended up in downtown Los Altos, which I had never seen before. I celebrated with a coffee, and as a bonus the sun came out. It's amazing what a little sun will do. I put my jacket in my bag and within a few miles I was entirely dry. And then a few minutes later, as I passed by Stevens Creek Reservoir, the sky closed in and it was raining again. I was once again soaked. Today's ride was a little over 80 miles, with 7200 feet of climbing. The most difficult kilometer was near the top of Route 9, at 7.8%. San Gregorio will wait for another day. 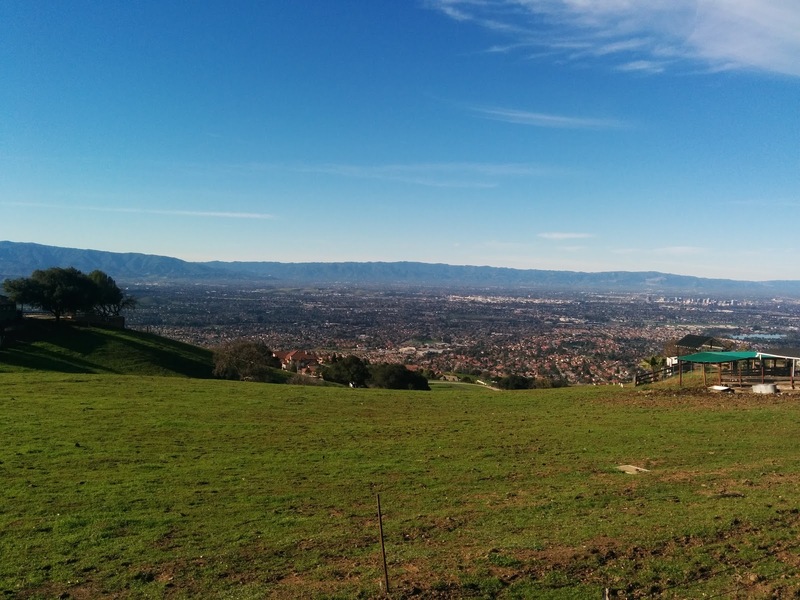 At the start of an extended holiday, I took a short ride exploring the hills between Los Gatos and Saratoga. These days I only seem to make time for longer rides on holidays, so since I'm taking the whole week of Christmas off I should be able to get in at least one good ride. 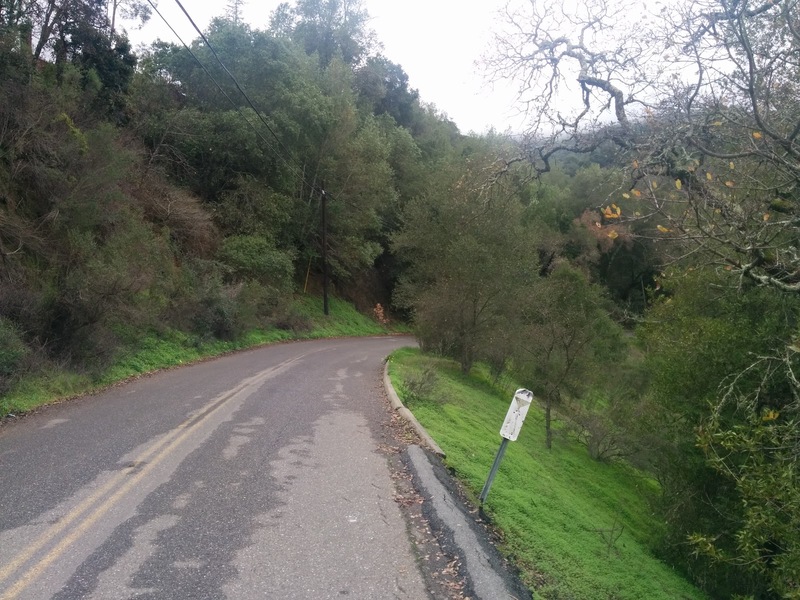 Today was not that day, but I did get in a short ride exploring some unfamiliar roads around Los Gatos and Saratoga, and mostly Monte Sereno. I started off at about 10 bundled up against the damp morning but almost immediately thinking I had overdressed. As I climbed up Kennedy I got comfortably warm right away, but if the clouds burned off as they so often do, I would be left steaming in my kit. The roads were wet as I took the steep and perhaps not quite legal route up Teresita and around to Cypress. Along the way you spend quite a while on a one-lane road marked as private, which adds a few BPM to your heart rate if the 20% ramps weren't doing enough already. Most of the route through Los Gatos reversed my normal evening commute. It seemed quite new to me partly because it was reversed, but mostly because it was daylight. I took the I've-always-wondered-where-that-goes Withey Road, thinking it would link up to Overlook. 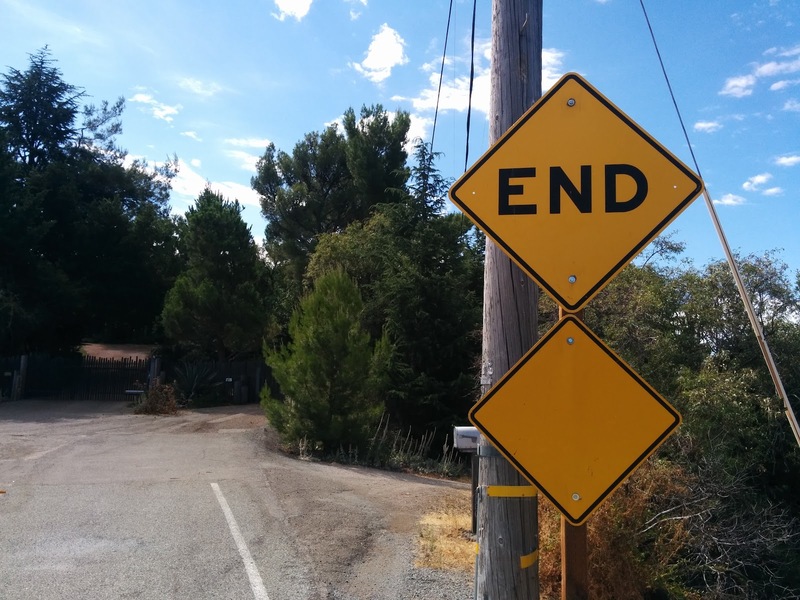 It just dead-ends. After that I went back down to Route 9, then skipped over to more side streets that I hadn't visited before. In Saratoga I started up Route 9. I've ridden down Route 9 from Redwood Gulch or Pierce most evenings this year, but this may have been the first time this year I was headed up. At Tollhouse Road I climbed the comically steep ramp, again reversing part of my commute. Then I headed over to Pierce to visit a little side road I've passed 100 times, only to find it too has scary "private driveway" signs a little ways up. Oh well. It was beginning to rain a little, too, so I turned back toward home. Along the way I headed back up to Overlook, reversing a route I'd taken once before. This involved riding up Lucky Road, which has "private" signs that aren't quite scary enough, apparently. Lucky Road is a barely one-lane winding road that today was damp and slick with mud and fallen leaves. It's steep the whole way, so I kept spinning my back tire. On Los Gatos Boulevard they were doing some road work, I think, so I took the proffered detour up Stacia and found a new way to Kennedy, via Worcester Park. And then the short trip home. Today's ride was just 32 miles, with over 3400 feet of climbing. The most difficult kilometer was the private road at the top of Teresita (maybe Paseo Carmelo? ), speaking strictly of the 13% grade and not the legal jeopardy. A good day, and with any luck preparation for a much longer day quite soon. Today I took advantage of the long holiday -- and some perfect weather -- to take a long ride for a sausage sandwich. Lately it seems like I never have time on the weekend for a long ride, so I've been getting what cycling time I can by riding home from work. That's pretty good exercise, but since it's in the cold and dark, it's not exactly ideal cycling. So on these long weekends I try to fit in a nice ride during which I can actually see the sights. Today I decided to work off some of the Thanksgiving meal by riding down to Corralitos for a nice lunch. I got started just before 9, dressing warmly against the morning chill. Los Gatos was very quiet as I passed through, and the Los Gatos Creek Trail was virtually empty. I'm happy to report that I made it up that dusty ramp near the end despite much sliding, largely because the trail was empty. The Laurel train tunnel, from the road. 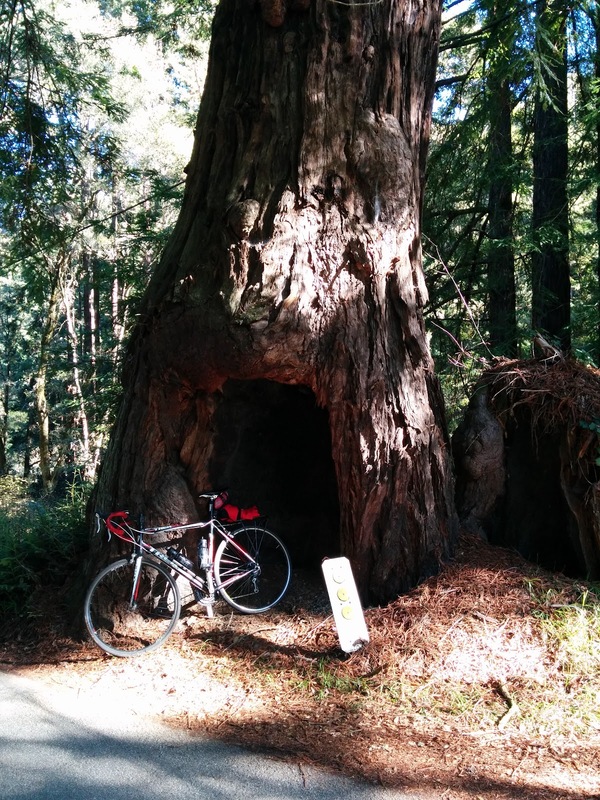 I climbed up Old Santa Cruz Highway to Summit, then dropped down into the Laurel on the way to Soquel. I've never caught a glimpse of the Laurel side of the Wright's Station train tunnel, so this time I kept track of where I was relative to the opening, at least according to the maps. I definitely couldn't see anything from the road. I continued down to Laurel, got the best glimpse I've ever had of the opening of the next tunnel in line, and then started up steep Redwood Lodge Road. 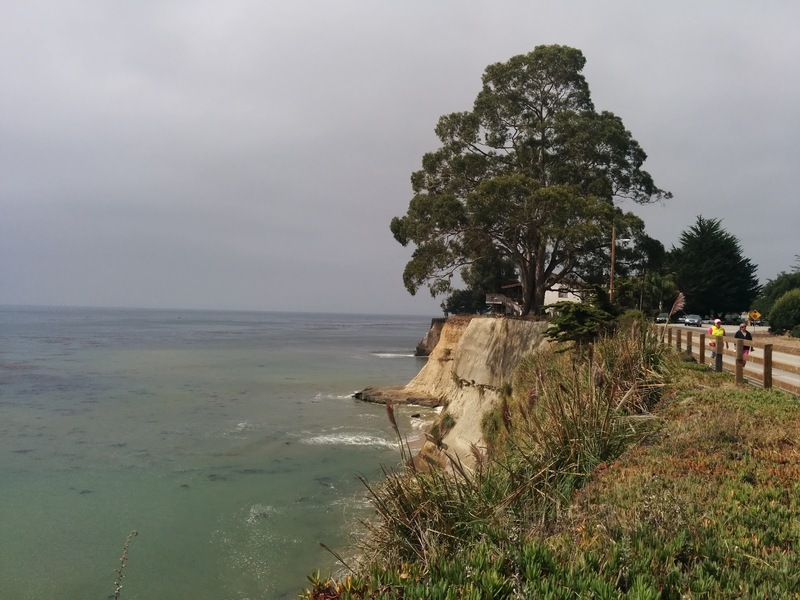 I descended into Soquel in good order, then took McGregor toward Aptos. 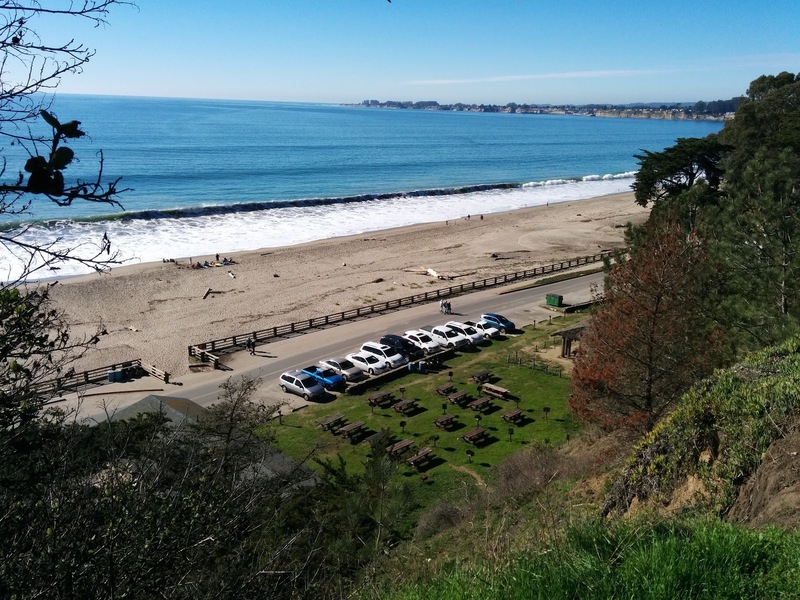 After a quick stop at Seacliff State Beach, where I finally stripped off my jacket, I headed back into the hills. 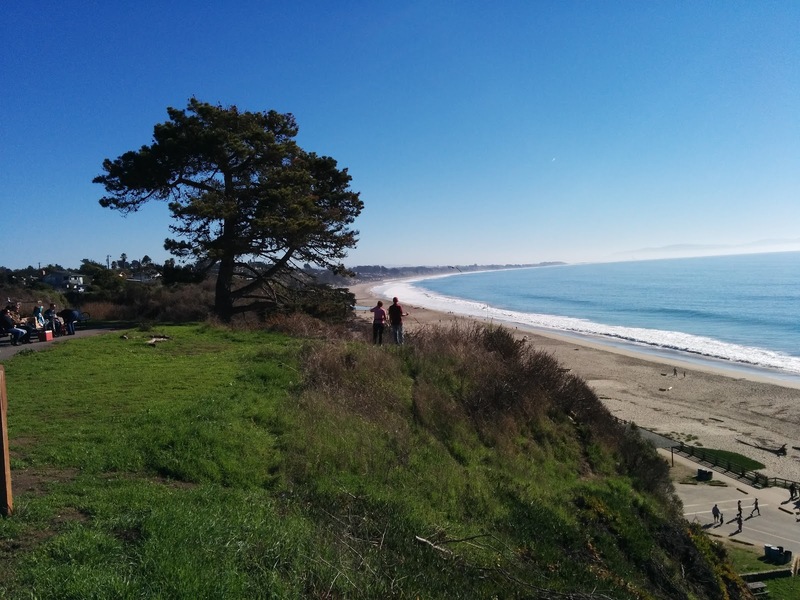 Seacliff State Beach, looking west. The plan was to take Valencia to Day Valley Road, but at the turnoff I decided that continuing on Trout Gulch Road to Valencia School Road seemed like a bright idea. 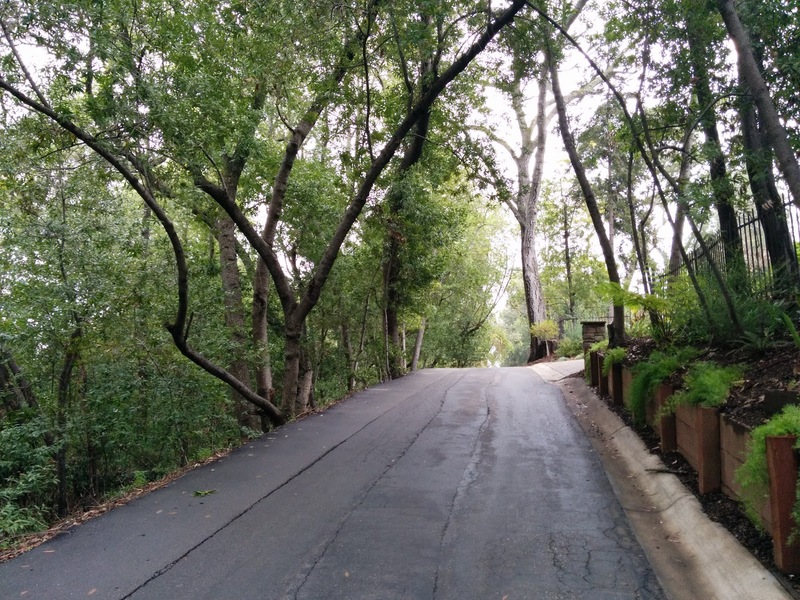 Valencia School Road turned out to be a tiny road with mighty steep ramps. It was in this section that my legs started to remind me that, while I ride 25-30 miles most weekdays, the ride so far today was already longer and had more climbing. After more steep ramps on Hames, I finally sat down for lunch at the Corralitos store. I ate outside in perfect weather. Having achieved the goal of the ride, it was time to head home. 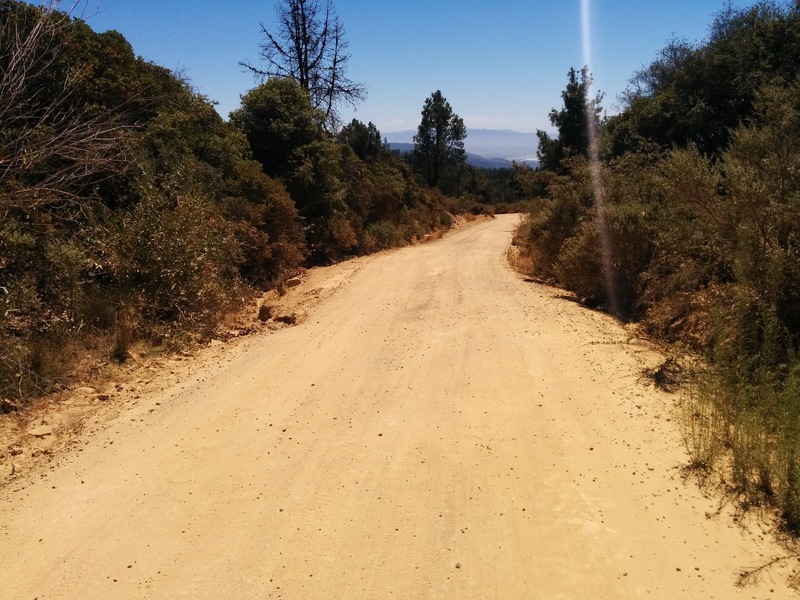 I went up Eureka Canyon Road, ignoring signs that the road was closed a few miles ahead. There wasn't much traffic, but at one point near the top a giant dumptruck came down the other direction, occupying about 110% of the one-lane road. I pulled over and waved. As it turned out the road was not closed, but obviously they're doing some construction on it, so I guess it's closed during the week on non-holidays. I'm not sure what they're doing, but one focus was re-doing some of the work done after the most recent wash-out. At the intersection with Ormsby Cutoff I had a flat. Maybe a pinch, but it had only one slit, along a seam. Maybe a defect? I continued on, gingerly avoiding the many potholes to avoid another pinch. The dirt trail that is Loma Prieta Avenue, from a little further up. At Mount Bache Road I thought it would be clever to ride up to catch the dirt part of Loma Prieta Avenue, a pretty little ribbon of road that I missed on a recent ride. This involved a trip up Mount Bache Road, which starts out quite reasonable but gets steeper as it goes along, and then some steep climbing on the dirt road, considering its surface. Ultimately I found that the road is much more enjoyable in the other direction, since the slower climbing speed offers more chances to see the amazing views. As a decent, the poor surface demands all of your attention. Not much else to report on the trip back through Los Gatos and home. I managed to get in before darkness fell, and I was definitely feeling the miles by the time I got there. Today's ride was just over 80 miles, with over 7100 feet of climbing. The most difficult kilometer was on the climb up Redwood Lodge Road, with a 9% average grade. It was great to see the ocean again, great to spend a day on the bike, and likely the last chance I'll have for this kind of ride until Christmas. 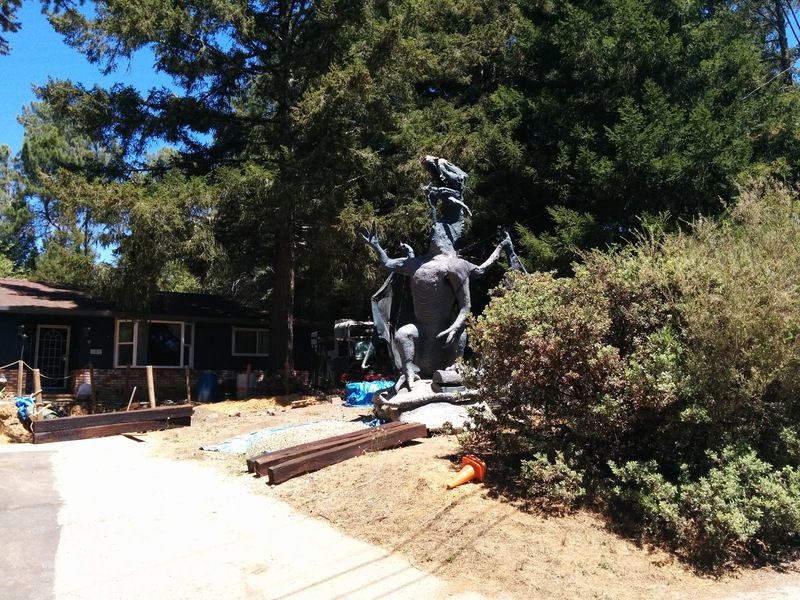 Today I rode to... well, near Loma Prieta, then passed through Mount Madonna park before heading home. Today was supposed to be hot, so after watching the finish of a very enjoyable Vuelta a España (won by a fellow named Winner! ), I got a reasonably early start. By 09:00 I was headed over Kennedy Road. On the Los Gatos Creek Trail I spun my back wheel on the dry, dusty ramp, and wondered how long it might be before rain firmed the trail up again. are on the left. Mount Hamilton is just visible in the distance. I stopped at the Summit Store for a half-sandwich, but since it was too early for lunch I dropped it in my bag and headed onward. 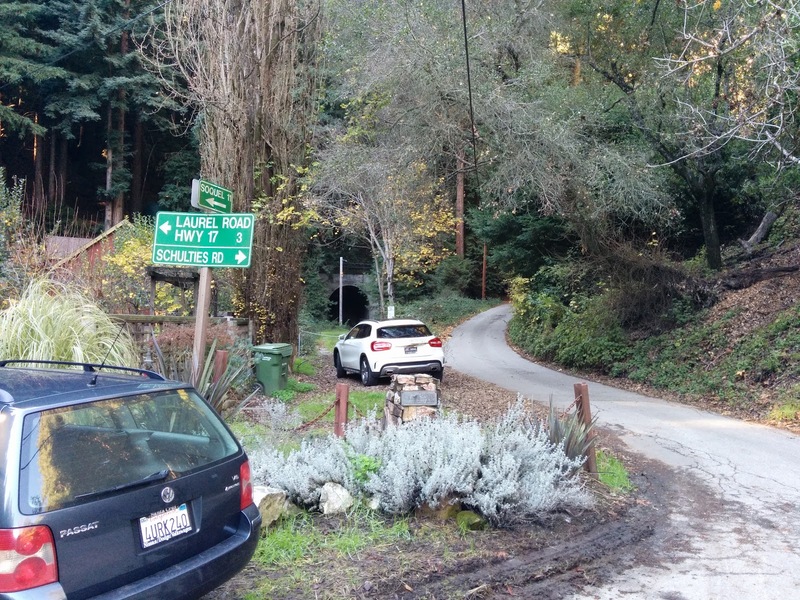 In the past I've always visited Loma Prieta via Loma Prieta Avenue, but this time I decided to try Mount Bache Road. 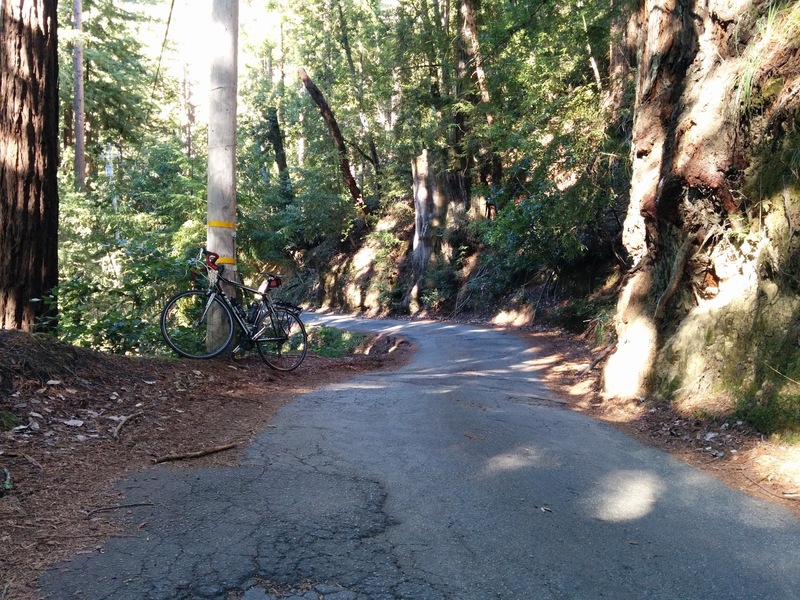 For some reason I thought it was a much harder way to get to Loma Prieta Way, but actually it wasn't especially steep until it neared the point where the two routes meet anyway. On the other hand, it means that I missed that great first view of the ocean from the lonely dirt part of Loma Prieta Avenue. At the junction with Summit Road, the high point of this ride I stopped and ate my half-sandwich, in a rare shady spot. The heat was climbing, and the effort of the steep parts of this climb were getting to me. I also drank much of my remaining water, but reasoned that it was largely downhill to Mount Madonna, the next water. The last time I passed through here, they had dropped loose stones on Summit Road, making it impassable by skinny-tire bicycles. That was well over two years ago, and in the meantime those stones had either been pounded into the dirt, or more likely ground into a combination of smaller stones and binding dust. Sort of a self-macadam process, which I suppose isn't accidental. In any case, the whole road is easily passable now, although still uncomfortably washboarded in places. I missed the always-open gate and impotent private-road sign. It may be gone, but I suspect I was just distracted. At Mount Madonna Park I refilled my bottles, then headed through the park to Route 152. As it turns out, 152 has a single-direction long-duration light, just like Route 9 near Saratoga. This one had traffic heading south backed up for literally miles, whereas northbound traffic (like me) waited just a couple of minutes. I wished I could have told them all how long the wait was. By this time the bike computer was showing over 100° F, which is... hot. 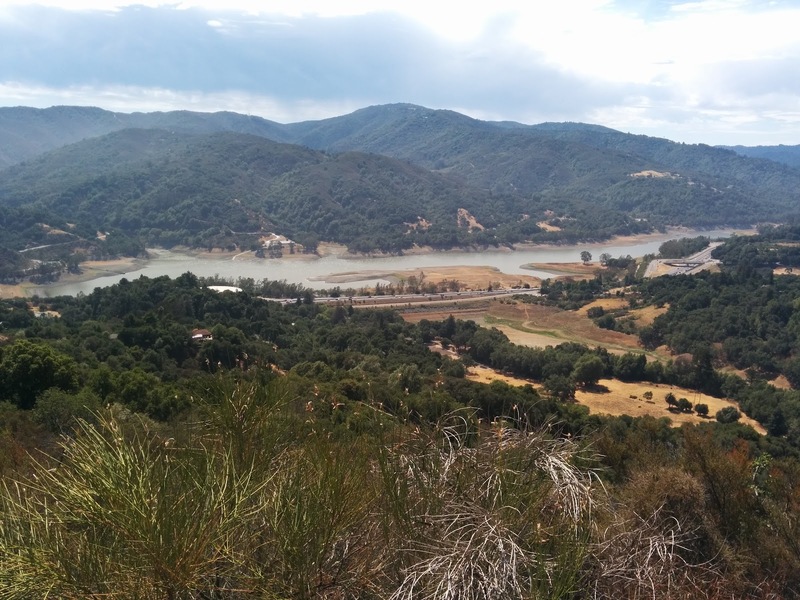 I headed up Uvas Road, stopping a few times to take pictures of the nearly empty reservoir. It was about this point that the wind decided to punish me personally. The flat sections became hills, and the hills became... actually they weren't much changed. And given the wind and the heat, it seemed like no matter how much water I drank, my mouth was always dry. Ugh. Eventually I rolled home, drained. Today's ride was over 68 miles, with over 4700 feet of climbing. The most difficult kilometer was near the top of the climb to Loma Prieta, with a grade of 11.6%. Those last kilometers, on completely flat suburban roads but against the wind, certainly seemed harder. 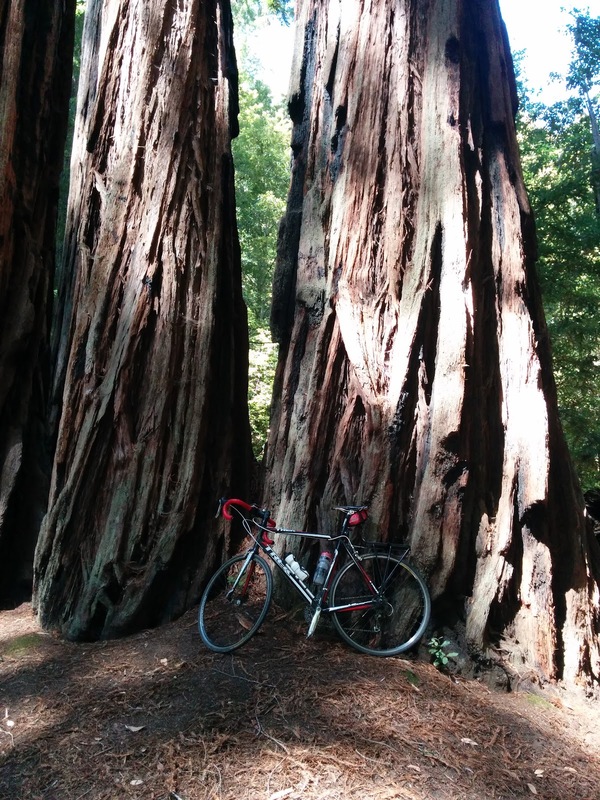 Yesterday I took a long bike ride, visiting Santa Cruz and Big Basin park, with Empire Grade in between. For one reason after another, I've rarely been able to take long, all-day rides in the past couple of years. But yesterday the stars aligned, so I set out to make the most of it. Accordingly, I got an early start, out just before 8 AM in the chilly morning air. I took my usual route over Kennedy to Los Gatos, but at the entrance to the Los Gatos Creek Trail I saw that there was some sort of running event happening on the trail. It turned out to be the Dammit Run. The trail, which is the only route south through the mountains for miles around, was clogged with runners, and unusable. I considered alternate routes, or just heading back home. But after a few minutes of sulking the density of runners eased, and indeed the runners coming by were now walk-running. Probably stragglers. What I would find out later was that the run had just started at the nearby high school shortly before I arrived, and so hadn't stretched out much when I first saw them. I waited a little while to give the race its peace, then headed down the trail myself, riding at a walking pace. At the dam the race and I separated, runners heading back over the Jones Trail while I continued on to Old Santa Cruz Highway and Capitola. In the end I wasn't even delayed by the race. I wanted to eat lunch at Betty Burger, which meets all my picky needs for a mid-ride lunch -- outdoor seating, not too crowded, in view of the bike. 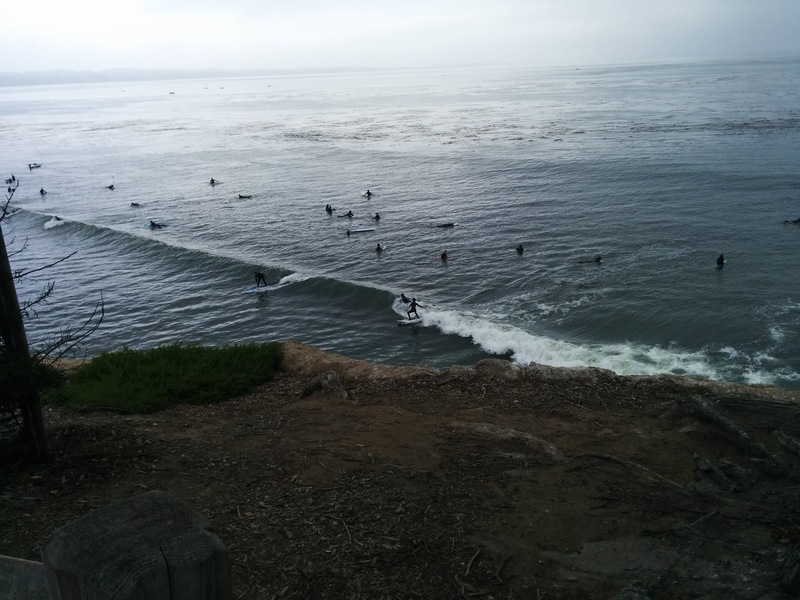 Despite the delay from the race I arrived in the area before Betty Burger was open, so I dawdled along the coast between Capitola and Santa Cruz watching the surfers, then had my lunch. After lunch I headed past the Boardwalk and up Bay Street to UCSC, where I turned on to High Street, which later morphs into Empire Grade. Empire Grade is an inconsistent climb, or perhaps series of climbs. The average is moderate, but the most difficult kilometer of the day was in this section, with a substantial 9.4% grade. Most of the climb runs through lovely shady woods, with moderate traffic. At the intersection with Felton Empire and Ice Cream Grade I decided to take Ice Cream Grade over toward Bonny Doon. The only time I've ever come up Bonny Doon Road I cut over on Ice Cream Grade, so this would give me a chance to see the rest of Bonny Doon Road. I try to include new bits of road in my rides, so this was just a token. Empire Grade climbs up above 2500 feet, then bounces along at that level for a surprisingly long stretch. 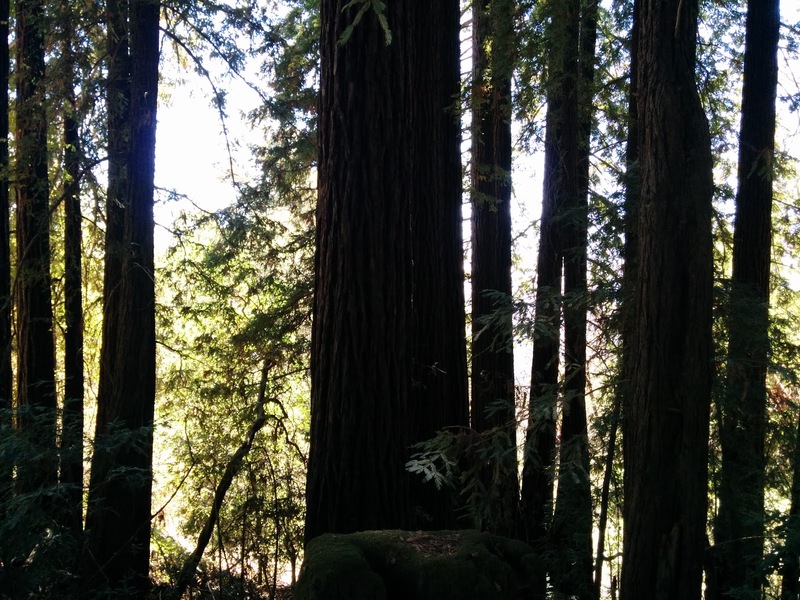 Eventually I reached Jamison Creek Road and made the steep descent toward Big Basin Highway, and then to the park. At the park headquarters I bought a two sugary drinks and a Clif bar. This ride was becoming much longer than I had planned, and being out of practice for long rides I hadn't been thinking about nutrition at all. In fact, one of the reasons I got an early start was because I forgot to eat breakfast, a major mistake. I was thinking I would save the Clif bar for later, but I just sat down on a bench and finished the bar and both drinks. 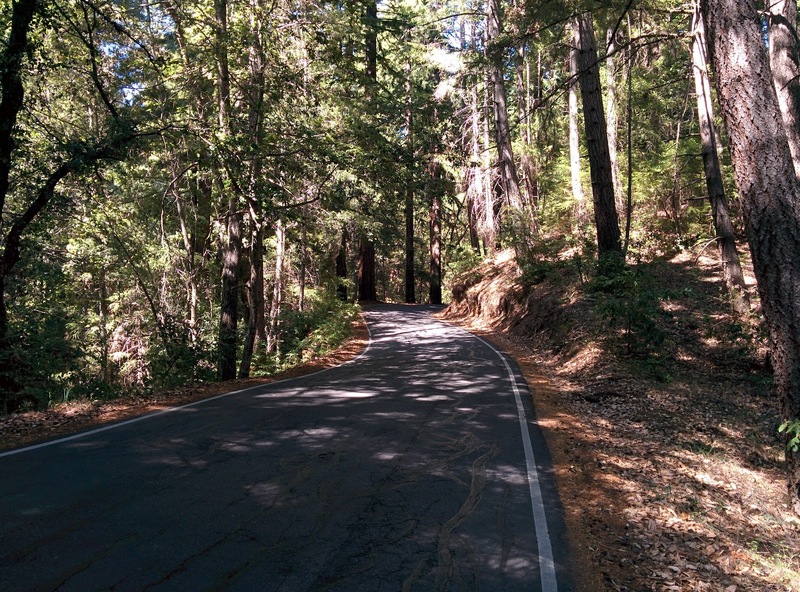 The section of Big Basin Highway heading north toward Route 9 is one of the most beautiful roads in the area. Yesterday it was warm but not hot, most of the road is shaded as it passes through bucolic woods, and there was little traffic. Beautiful. After descending toward the junction with Route 9, I started on the last substantial climb of the day, up toward Saratoga Gap. I was definitely feeling the miles by this point, and realizing that this ride was going to be a surprise century, over 100 miles. I hadn't planned on that. On the way down I passed by a recent motorcycle accident. Officials had yet to arrive, but perhaps 20 people were stopped, directing traffic and attending the rider. A somber sight. I continued my descent at a moderate speed, but to be honest that was only because I was held up behind a line of cars that were held up by another cyclist. As I continued home I meandered a bit, trying to ensure that this ride was the longest I've recorded. That feels like cheating, so as a small penance I decided that any tacked-on distance would have to be uphill. This ride was a little over 104 miles, with over 9300 feet of climbing. Both records for me, and a nice surprise. A day well spent. Today I slew an already-dead dragon, did some suburban archaeology, and succumbed to a compulsion. All before lunch. I won't say that I'm in good shape, but having recently returned from a cycling vacation, my condition is about as good as it's likely to get. 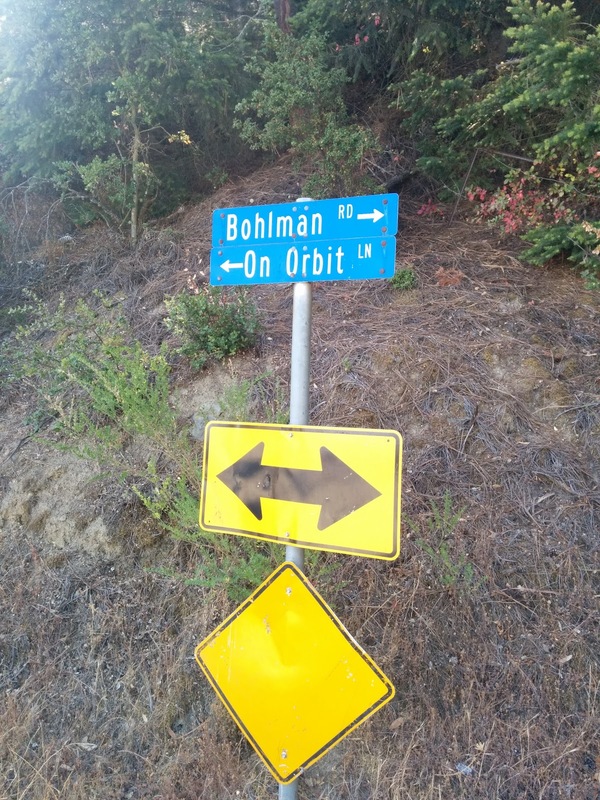 So what better time to try one of the few local climbs that I've never tried: Bohlman Road and On Orbit Drive. The Stanford cycling page (which has now been updated; how disconcerting!) scared me off years ago, and I've always consigned Bohlman to a set of preposterous climbs not suitable to normal humans. It's really not that bad. Today was supposed to be reasonably warm, so I got an early start heading over Kennedy to Los Gatos. Since this is part of my daily commute I'm always looking for new routes through here, so today I decided to follow Overlook Drive around. At least I thought Overlook Drive came back around to Route 9, but instead it just dead-ends. To get back to Route 9, without retracing all of Overlook Drive anyway, you take Lucky Drive. That's a one-lane road marked private, but it gets the job done. 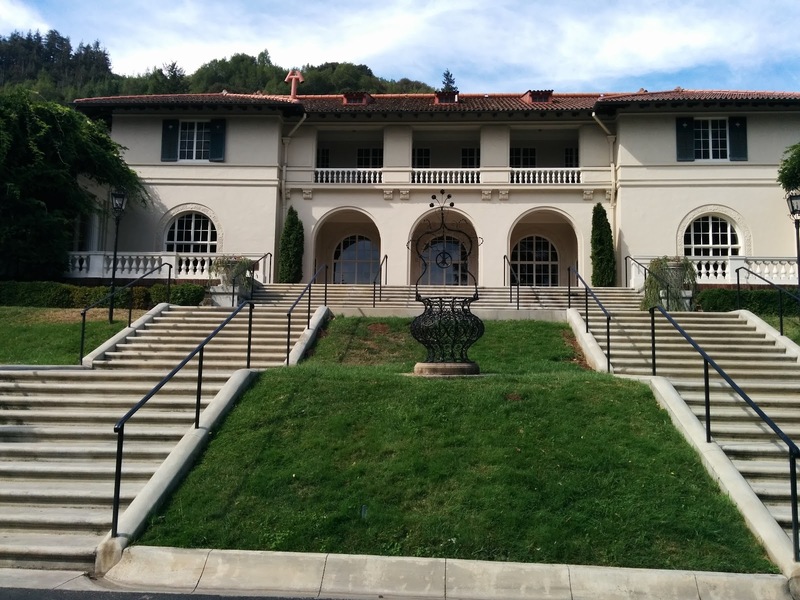 While I was in the neighborhood I also visited Montalvo, which up to a couple of months ago I didn't realize existed. It's quite pretty, and worth a visit. After that it was time to start the morning's major climb. I took a left from Route 9 onto Oak Street, which turns into Bohlman at the cemetery. Bohlman is steep, no question. The lower parts are a little more forgiving at only about 12% or so, and quite beautiful as the road shrinks in width and climbs through woods. The road climbs up toward the southwest, then eventually turns toward the southeast and gets distinctly more difficult. Partly that's because the grade really does increase, but also you can see more of the road rise ahead of you, without respite. Shortly after this starts you reach the intersection with On Orbit Drive, which peels off to the left. This part is even steeper; the most difficult kilometer of the ride was in this section, averaging a bracing 14% despite a flat section in the middle. The morning was still reasonably cool, but the top of On Orbit Drive is exposed, and it must get awfully hot in the afternoon. When people talk about climbs having a maximum gradient of something or other, I always wonder how they're measuring that. I suspect they're using a level, measuring a few meters at most. That's not especially meaningful to a cyclist -- if you can be past the spot in a couple of pedal strokes, it doesn't matter. My analysis program breaks the ride into approximately 100 meter segments, plus or minus 10 meters as it tries to divide segments at grade changes. Even with that fairly rigorous standard, there were several segments near the top of On Orbit that registered over 15%. And 100 meters of 15% definitely matters. After one of these extended 15%+ segments you get to the top of On Orbit, and your reward is a brief descent to meet up with Bohlman again. Then you continue climbing, but at moderate grades and with occasional flat sections in which to recover -- it's time to shift out of the granny gear. Five hundred feet of climbing remain, but the hard part is over. Shortly after reaching the southern side of the ridge, you reach the end, marked by a sign saying exactly that. At this point there's a dirt road that connects with the El Sereno Open Space Preserve. I've come through in the opposite direction so I know where it is, but it's definitely not obvious from this direction, and there's no sign. For the record, it's the dirt road just past the "End" sign, and looks like a driveway from Bohlman. 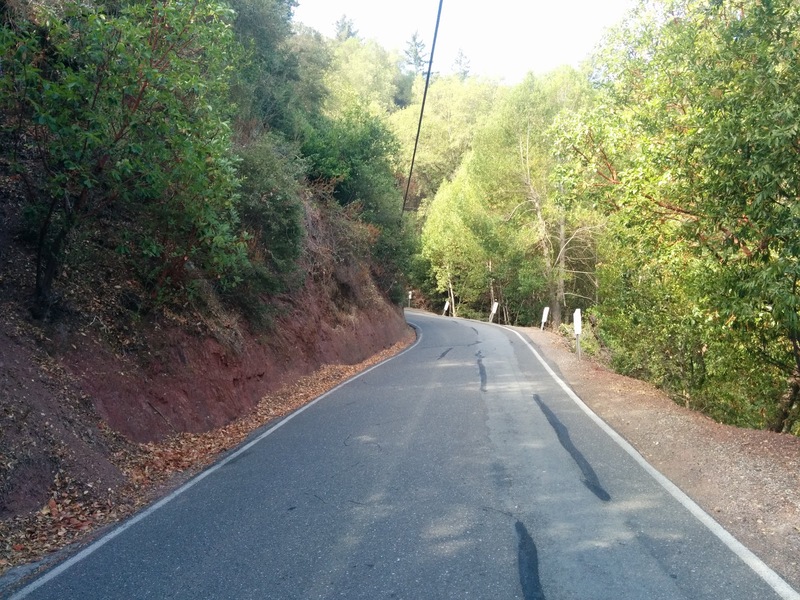 The short dirt section, well within the abilities of any road bike, leads one to the top of Montevina Road, which twists down toward Lexington Reservoir. 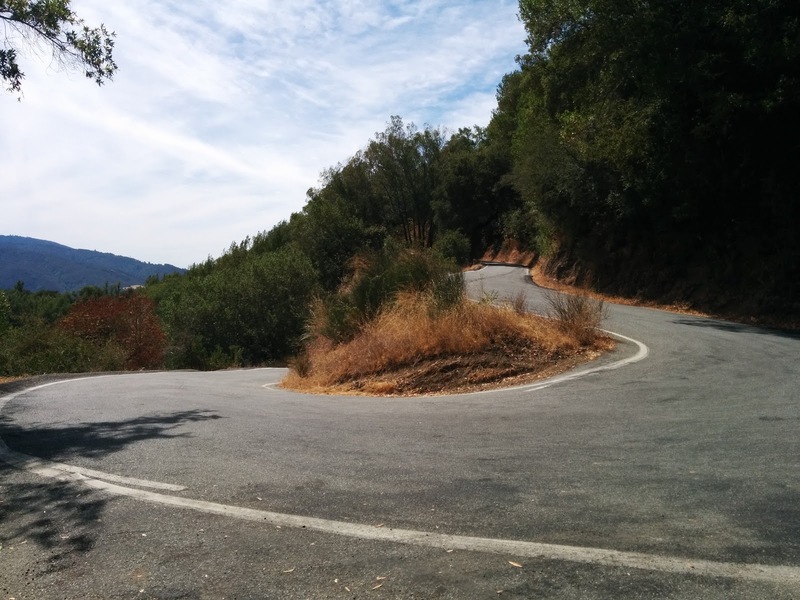 Montevina is not a great descent, being a bumpy little road with far too many turns. At least there's not much traffic. We're experiencing a long drought here in California, and Lexington Reservoir is about as empty as it's been since I moved here. I've heard that in periods like this, bits of the drowned town of Lexington get exposed. 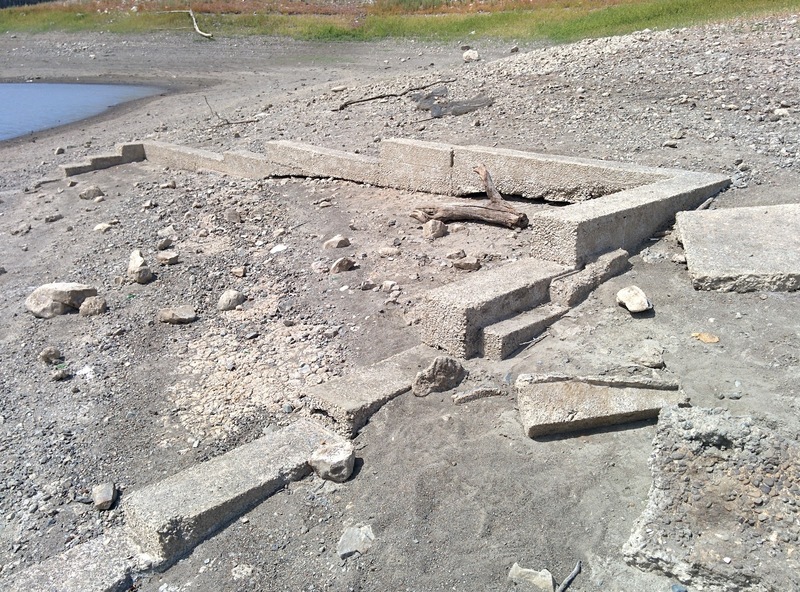 So this time I hiked down into the reservoir to see what could be seen. This involved walking my bike down trails covered in a pretty golden layer of what I only belatedly realized were puncture weed burrs. But I was walking the bike and they were dry, so I got no flats. Still, I carried the bike once I twigged on. 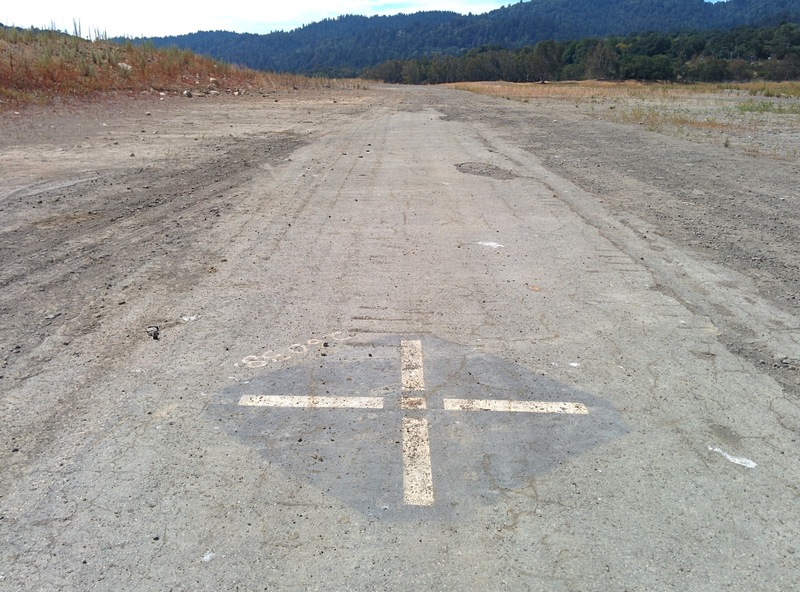 The old alignment of Highway 17 was easy to identify, but I didn't see much in the way of exposed foundations. I'm not sure where Lexington actually sat, so I don't really know where to look. After tramping around a bit I carried my bike back out to the current alignment of Highway 17, survived the dusty, steep bit on the Los Gatos Creek Trail, and headed home. I mentioned earlier a slain dragon -- that was Bohlman. The archaeology was in Lexington. The compulsion? The story behind that is that this was actually the second time I've climbed Bohlman. The first time was last Sunday, and several of these photos are from that trip. I felt like I needed to do it again because my Garmin 500, through some combination of hardware fault, software bug and/or user error, lost the track for that earlier ride. For me, not having a track for a ride -- particularly one that I've not done before -- has become a little like not having done it at all. Oh, who am I kidding? It's a lot like not having done it at all. I try to ensure that I ride only for enjoyment, so I don't focus on timing and (almost) never use Strava. But this bit of completism has been hard to stifle. It's a sickness, undoubtedly. Today's ride was short but sharp: 34 miles and 4500 feet of climbing, most of it quite steep. The most difficult kilometer was around On Orbit Drive, averaging over 14%, and I can tell you that it definitely seemed that way on the bike, at the time. And yes, the track got recorded correctly this time. Having returned from my second tour of the French Alps, it's a good time to reflect on what went well and what could have been better. An elevation profile of the entire trip. For this trip I rented a bike from Cyclomundo.com. I was of course worried that it wouldn't show up, in which case my plan B was to rush out somewhere in Lyon and buy a bike, then hope to sell that bike for whatever I could get at the end of the trip. I was also worried that the bike might show up late in the day, making the first long ride to Grenoble rushed and awkward. In the event, neither happened. In fact, while I was checking into my hotel one of the clerks heard my name and said "I think we have a bike for you." What a relief. 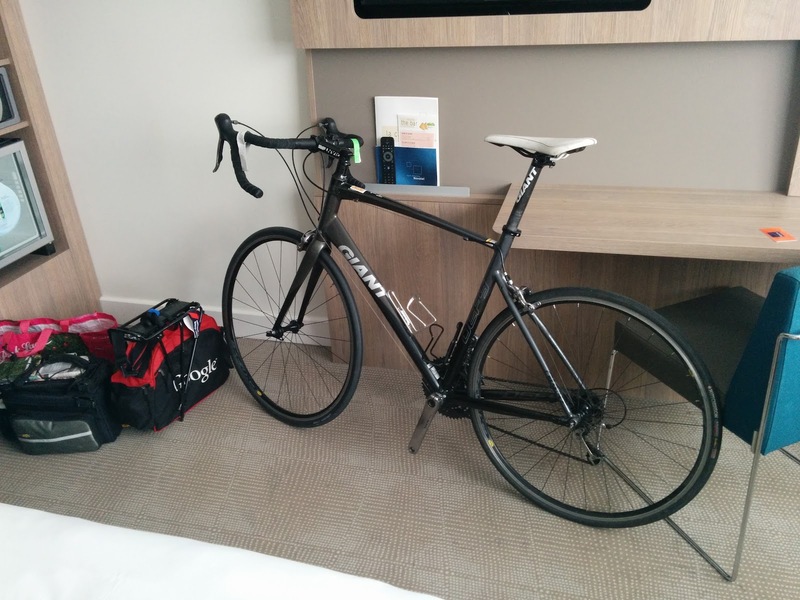 And honestly, what service from both Cyclomundo and the hotel, the Hotel Novotel Lyon Confluence. The bike was a Giant Defy 1. Cyclomundo also provided a bag of goodies like a helmet, a lock, flat pedals, some tools, a water bottle, tubes and a small pump. That was mostly superfluous for me, but I did end up using their pump instead of the one I brought, as theirs was slightly more compact. The Giant was actually Cyclomundo's lower-end bike. I chose it because it had an aluminum frame, and thus seemed more likely to accommodate my rack. That worked fine, in part because I brought along a seat tube clamp with rack mounts. The frame also had mount points on the stays, so it would probably have worked either way. I brought my own pedals, as one must, and in retrospect I might have been slightly more comfortable had I also brought my own saddle. The bike was in good shape, although the brakes were quite worn. I would later come to find out that while they looked good, the wheels carried a layer of fine dust (brake dust?) that left me a mess after repairing flats. But that's certainly understandable. When I left the hotel I left a bag containing all the extra Cyclomundo stuff, and also the few things I brought that I wouldn't need on the trip. I suspect this is something that all hotels are willing to do, but nonetheless I was grateful. It was especially convenient for me because I was returning to this same hotel. That was very helpful, and not something I had really been thinking about when planning the trip. At the end of the trip I just left the bike at the hotel's front desk. I imagine that Cyclomundo picked it up later. I never even saw anyone from Cyclomundo in person. The two-week rental, plus a fee for delivering the bike to Lyon, came to less than $500. That's much less than the fees I paid in 2012 for bringing my bike on the plane. That year I also had to make disposable cardboard bike boxes on both sides of the trip, which would not have been feasible this time, so a bike bag would have been an additional expense. Meanwhile, it was incredibly freeing not to have to lug a bike bag through the airport and find transport to/from Lyon that could accommodate such a large package. Some people are very picky about their equipment, or have an unnatural attachment to their particular bike. For them, renting a bike would be uncomfortable. I'm not like that. You shouldn't be, either. I was surprised that anyone had a road bike to rent in July in the Alps, and I'm surprised the experience went as well as it did. But given all that I think renting was the vastly superior way to go. In 2012 I traveled to and from Paris, taking the train down to Grenoble to start the trip. This time I flew to and from Lyon, which of course meant that I flew through Paris and connected. I made these plans, and indeed the reservations, before I knew whether I would rent a bike or bring my own. Consequently I needed to be able to ride from wherever I landed. I also left plenty of time between flights in Paris, to clear customs with potentially bulky baggage. That plan was fine, and I got to see Lyon. But while I can look back fondly on the rides to and from Lyon, they were long and not especially eventful. In retrospect flying via Geneva might have been a better idea; closer to interesting terrain and the lovely Annecy. But armed with the knowledge that I would be renting a bike, flying into Paris and taking the train to Grenoble, as I did in 2012, might have been the best bet. After the 2012 trip I felt like I had been too cautious in my planning. I averaged about 40 miles and 4500 feet of climbing per day, and had a couple of built-in rest days. This time I felt like I did better, but having said that I averaged 52 miles and 4700 feet of climbing per day -- basically the same. The main difference was just that this tour was longer, and had only one rest day, reluctantly taken due to semi-broken bike. At the end of every day's ride, I felt tired but not really drained or worn out. I suspect dehydration really wears me out, so the cold and rainy beginning of the tour probably helped. I could certainly have gone further any particular day, but most days I was able to watch the last part of the Tour de France stage on television, and I was always recovered in time for the next day's ride. The Romanche and Isere valleys (i.e. the valleys of Bourg d'Oisans and Moutiers, respectively) were both beautiful and pleasant. The valley of the Arc (the Maurienne, home of Saint-Jean-de-Maurienne) is beautiful too, but also very industrial and heavy with traffic. In the future I'll keep that in mind as I plan where to pass through, and where to linger. Hotel rooms in France are inexpensive, in my experience. I stayed in nine different hotels, of varying size and quality, and in all cases the prices were probably half of what I would have paid for similar rooms in the U.S. For me, far along in years and less price conscious than I once was, it meant that I could choose highly rated places, enjoying the pampering with still-reasonable prices. I used booking.com to make my reservations, well in advance, and none were lost or confused. Twice I went without dinner. Once was in Briançon, because the hotel had no restaurant, there were no good restaurants nearby, and I was tired and lazy. I had plenty of options there, and going without dinner won out. The other time was in Tournon, because the hotel had no restaurant, and there were no viable alternatives. That was bad planning; I knew that the hotel was isolated, so I should have paid more attention when I booked it. In any case I should have stopped at a store earlier on that Sunday to stock up on plan B food. Lesson learned. Packing and unpacking every night can get tiresome, so occasionally staying more than one night is helpful. It also means that you don't have to carry all your stuff on the bike, which helps. I stayed mostly in small family-owned places, but also a few major chain hotels. The chain hotels on the whole tended to be quieter -- no squeaky floors, for example. As a rule they have more modern facilities and services, like hair dryers (which for me were sock dryers), laundry services (which I never used but should have), and even swimming pools. All the places had good showers and televisions, for some reason. The family-owned places can be charming, but you must be mentally prepared for compromises. That was fine for me, traveling alone. Ensuring that you at least occasionally find yourself in a full-service hotel can be enough to get the chores done. I brought two sets of riding clothes -- bib shorts, jersey and socks. That worked fine for the plastic clothes, but the socks rarely got properly dry. By the end of the trip they were getting funky. This time I brought specially-purchased off bike clothes. The dark golf pants were lightweight, looked OK, and packed tight. The one button-down shirt held up pretty well despite not being washed for two weeks. That took some discipline: I wore it only to dinner, always with an undershirt, and never in the warm part of the day. Unlike 2012 I also brought some non-cycling short pants, which were very welcome for walking around town. As it turned out, I was ill prepared for the cold, wet weather, and had to buy lots of stuff along the way. I suppose that was an acceptable gamble. I now have extra sporty jackets that I'm unlikely to need. At least they were reasonably priced. For this trip I brought even more gadgets than I had the last time. I brought the same netbook computer as I had in 2012, which again seemed necessary but may not have been. It allowed me to offload photographs and videos every night, but extra SD cards would have served the same role. I liked having it, and I used it to record notes about the rides, but it wasn't essential. This time I brought a GoPro camera. Yeah, I was one of those guys. I wouldn't do it again. I took movies of several descents, and while they are technically great (the movies, not the descents), even I can barely tolerate watching them. I also used the GoPro to snap a short sequences of photos. I've posted a couple of them here, but I took hundreds, and virtually none are worth a second glance. Ultimately I think the GoPro is better for documentation than photography. It's almost always better to just stop, take out a decent camera, and frame a proper scene. My "decent camera" was a Nikon Coolpix S6500. It's compact, I'll give it that, and it has a good optical zoom for such a small camera. It's software is slightly flaky, such that it occasionally took a while to start and several times took much-too-dark photos. In the sunlight, with polarized sunglasses, it's hard to notice that problem and re-take the shot. I think I still like the photos taken by my old Sony Cyber-shot DSC-H3 better. I used a program called GPSCorrelate to assign locations to the photos taken by the Nikon and GoPro, by correlating the timestamps of the photos with a GPX track produced by my Garmin 500. It worked quite well. I bought a small flexible tripod so I could set up the camera for timed photos. That worked well, and would have been more useful had the weather allowed more photography in general. On the 2012 trip I had an iPhone, and now I carry a Nexus 5. I like the new phone better overall, but its battery use is much worse and it only has 16 GB of storage. So this time I did something really smart: I brought my daughter's old, obsolete 5th generation iPod Nano for listening to my audiobook while I rode. That spared the phone battery, and the iPod had plenty of space for all my music and even a few videos, too. In at least one case I could use the television to watch the videos on the iPod; had I thought of that earlier I would have loaded more video. The iPod is also very small and practically weightless. Using the iPod meant that the phone was only used for occasional photos and for looking at the map on OsmAnd+. At the end of each day the phone battery was always perilously low, but it never quite ran out. I had five devices -- two cameras, the iPod, the phone and a Garmin 500 computer -- that all used USB cables. One day I had lost the power adapter for my netbook, which was doubling as my only "wall wart". On that day, I was able to recharge everything by plugging them into the television. Yay, standards. But those devices had four different USB connectors and thus required four different cables. Boo, "standards". I used the same Topeak MTX bag as last time. I make heavy use of this bag, and I don't think they make it anymore. The similar bag they sell now seems too small to hold a laptop, which I did on this trip but more importantly I need to do on my usual commute. I'm not sure what I'll do when this one finally falls apart. One of the handiest things I brought was a small assortment of velcro bands. They are light, pack in any space, and I used them for everything -- they made packing bulky clothes feasible, and I even used them as a belt. In 2012 I took the time to put in some serious miles before my trip. This year I was much busier at work, so my training consisted almost entirely of my commute. Over the winter that was just a straight ride home, but gradually it expanded to include a trip up Mt. 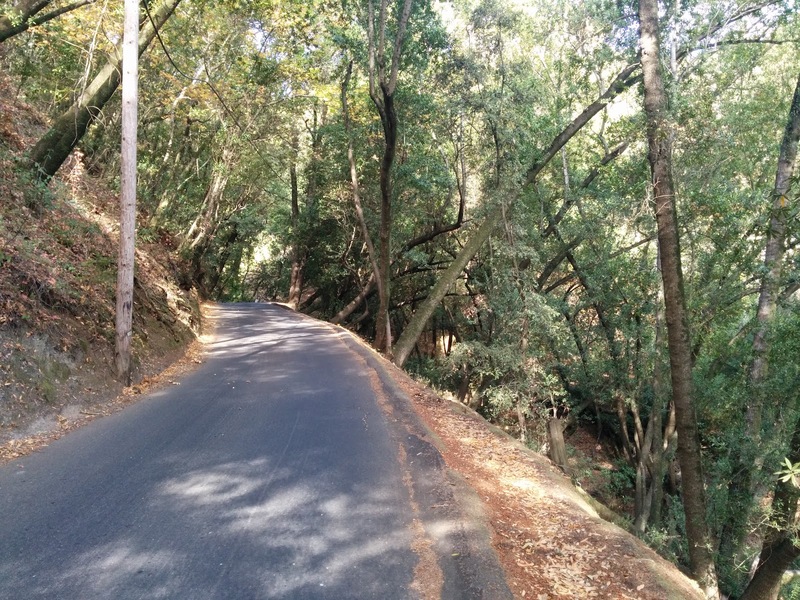 Eden, Pierce and Kennedy roads, and then later substituting Redwood Gulch for the first two climbs. That was almost every night, but less than 30 miles and less than 2000 feet of climbing, at the most. Realizing that I wasn't going to be able to put in the miles, I resolved to lose some weight, starting appropriately enough on January 1st. For the first time in my life, I regularly weighed myself and tracked the results. That worked better than I expected. Just before I left I weighed myself, fully dressed and carrying all my gear (even the stuff I would leave at the hotel), and the total was less than I weighed in 2012. I suspect that helped a lot. Everything worked suspiciously well. Not having a support vehicle, I feel like I have to plan a little more; my natural inclination would be to improvise. But having said that, the planning worked quite well. I love riding on these famous climbs, but honestly I think riding around less-familiar (to me) parts of the San Francisco mountains or the Sierra Nevadas (the ones here in California) might be similarly gratifying, and a lot less hassle. I might try a more-local tour next time. We'll see. On July 17th I completed my 2014 tour in France by returning to Lyon, from Chambéry. In fact I even returned to the same hotel. The day started, as usual, with a breakfast at the hotel. The hotel was fairly well established (i.e. old), well maintained and had an elegant feel. Breakfast was the usual selection, and great. Once on the bike I weaved westward through town, consciously trying to avoid consulting the map. My objective was, after all, pretty obvious -- it was to cross the suddenly formidable-looking line of mountains to the west. Along the way I rode through a square in which a few dozen soldiers in striking white uniforms sat around having their morning coffee. According to Wikipedia, Chambéry is a base for the Chasseurs Alpin, mountain infantry, so that must have been them in their regionally-appropriate camouflage. As the town gave way to the more rural foothills, I was looking at the line of mountains, trying to figure out where the pass, the Col de l'Epine, might cross. There wasn't really a low point. That was worrying. is the southern-most extension of the Jura mountains. The Col de l'Epine is the notch on the far right of the photo. The day got started with a short sharp climb, one that included the most difficult kilometer of the day at 8.9%. After that the road leveled off a bit, then began a much more reasonable climb right up the ridge. The day was clear, and the climb was warm but not uncomfortable. The road gradually shrank down to one of those 1.5 lane paths on which cars would have to slow down to pass. As it passed into thick woods, it reminded me of Route 236 climbing out of Big Basin. Really beautiful. The woods obscured most views, but toward the top there was a scenic overlook, looking back on the valley. At the top there was the usual sign, but in this case some guy was sitting right in front of it, leisurely eating. I didn't want a picture of that dude, so I didn't get my usual picture. He was camped out at the sign, and there were actual campers just emerging from their tent, too. The road rapidly descends into a really pretty little valley, and then immediately begins climbing another hill toward the Col de la Crusille. All right, you'll never hear about that climb affecting the Tour de France, but how much more of this would there be before Lyon? Not much, as it turns out. From there on, the road wound through pretty little towns, and the day got hotter. As I passed a fellow on the road he looked at me funny and asked whether it was too hot for riding. "Pas du tout", I told him, after a moment's translation. Later I would begin to see his point, as the temperature continued to rise. I followed minor roads until La Tour-du-Pin (why do all the towns in this area have "tour" in their name?). There I merged onto the D1006, a loud, busy, major road. After picking up some food I had lunch in a pretty little park near Cessieu. I had filled my bottles again, so I was marginally prepared as the temperature rose past 41C on the long stretches of D1006. Once I got past the airport, I cut right to find a little peace on more lightly traveled roads. The heat must have been getting to me, because in this stretch I kept taking wrong turns despite staring at the map. I missed most of Genas that way. Gradually the farms turned to suburbs, and the suburbs into the town. I was once again in Lyon. I entered on D29, the Route de Genas, then the Cours Gambetta. That crossed Rhone at the Pont de la Guillotière, and onto the penninsula proper. I hadn't had a chance to see much of Lyon on my arrival, so it was great to see this lovely old tourist-friendly part of town. I figured I'd ride down whatever road hugged the Saone, but as I approached the river I saw the beautiful buildings on the other side, and went to see them. A bike's not a bad way to take in the sights. You can go just about anywhere if you're reasonably polite about it, and yet make good time between stops. What I wouldn't recommend is riding 120 km in 40C+ weather beforehand. It makes one less inquisitive. I think this was a police station. I rattled down the cobbled streets toward the confluence of the Rhone and Saone, and my hotel. I arrived, my two-week ride complete, tired and crispy. Virtually all day I had been riding east to west, with the sun off my left shoulder, so my left arm and leg were quite burnt. On the whole I was also pretty dehydrated, and happy to have a long cool shower. After that I watched the Tour de France end its 12th stage in Saint-Etienne, just an hour's drive to the southwest. The restaurant at the hotel was closed for a Jazz party (a Jazz party? ), so I went to the attached Confluence mall to find dinner. I ate at a restaurant called Hippopotamus, which didn't serve its namesake. I had a very rare steak, sitting outside on the patio. Honestly, it was still too hot for that. I had another 50 cl bottle of wine, which is too much, and only at this late stage learned that it was apparently socially acceptable to take the rest of the bottle home. I definitely did that. This last ride in France was 73 miles, with almost 3500 feet of climbing. As I mentioned earlier, the most difficult kilometer came within the first few miles, climbing out of Chambéry early in the morning. I had absolutely enjoyed my tour, and every morning I was eager to get on the bike and ride. But this day's ride had drained my energy, from the surprisingly long climbs in the morning to the hot slog through the countryside. I was done. Well done.